The Language of Conservation is an interdisciplinary research group that seeks to change the way we talk and think about the value of life in all of its diverse forms. The two professors argue that we have been using the language of economics applied to nature, but that is a language incapable of grasping the value of life—except for its value to human development. “As the great conservationist Aldo Leopold noted long ago: when it comes to nature, we are at the frontier of ‘values as yet uncaptured by language,’ he added. Both Guevara and Campagna have a great appreciation for the wide variety of ways in which our language and terminology can limit, shape, and often distort our thinking. Campagna has been involved in conservation action for three decades, and Guevara has taught ethics for many years, including environmental ethics. 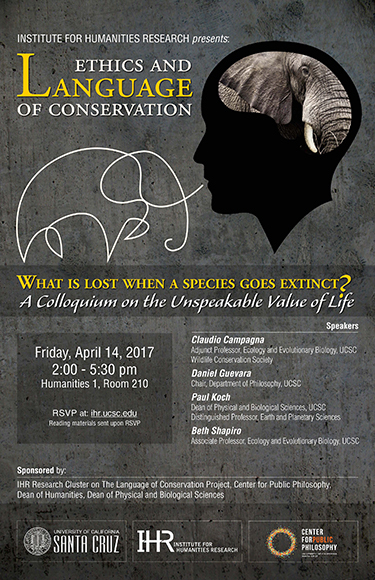 They will be joined at the April 14 event by Beth Shapiro, associate professor of ecology and evolutionary biology; and Paul Koch, distinguished professor of Earth and planetary sciences, and dean of the Division of Physical and Biological Sciences. This event is sponsored by the Institute for Humanities Research and the Center for Public Philosophy at UC Santa Cruz. It will run from 2 p.m. to 5:30 pm at Humanities 1, Room 210. Admission is free and open to the public. RSVP at ihr.ucsc.edu.